I am very excited about this because I love the combination of molasses and all the dark, sweet spices that usually go along with it, and prior to this little challenge I had never even *heard* of molasses bars, so this is a brand new (to me) recipe. Is it a regional thing? I don’t know! Who cares! Let’s make some molasses bars and then eat every single one of them in one sitting! 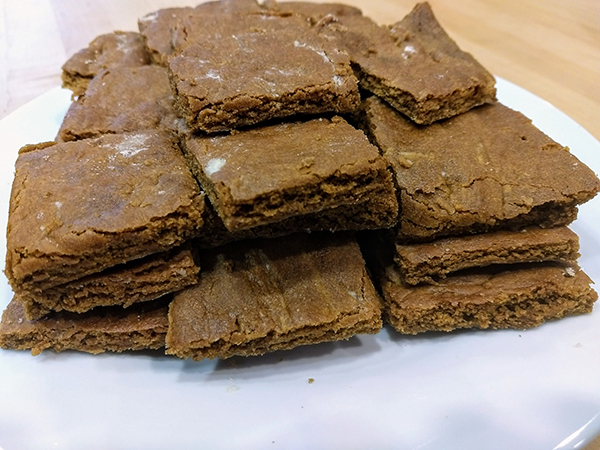 A quick search of the internets finds a variety of things called ‘molasses bars’ so I am not actually sure if the one I made is the ‘true’ molasses bar, or if there is such a thing as a ‘true’ molasses bar, but I digress. Basically this comes together like a stiff cookie dough – the sort that is usually rolled out and cut out with cookie cutters, except that for these, you grease and flour a cookie sheet (did they provide a size for this? No, they did not, which is a bit frustrating as cookie sheets come in a wide range of sizes) and then you press the dough into the cookie sheet (this will be messy! Use lots of flour) and then you bake what is essentially a ginormous soft molasses cookie. The recipe calls for raisins, but as previously discussed on this site, raisins are Not Food, and thus, I ignored that ingredient, because why sully such a delicious morsel with those grape abominations? Why? Here they are in all their molassesy glory. Verdict: Absolutely delightful. I am saving this recipe and will definitely be making them again. Like most things made with molasses and those spices, they need time to sit, so the flavors come through, and are thus likely to be much tastier the day after, than fresh from the oven (although fresh from the oven is also quite delicious). Also one batch makes a bunch, so it’s convenient that Richard’s writers group met at our house tonight, so that the bars could be distributed among a larger group of people and thus were not left to sit on the counter to tempt me. They were indeed wonderful. For those of us who enjoy the shriveled little delights known as raisins, I think those would be an excellent addition.